TORTOLA-Kyron McMaster won his 400m Hurdles semifinal heat on Friday evening and automatically advanced to today's final in the XVI IAAF World Jr. Championships in Bydgoszcz, Poland. He will face the starter's gun at 1:15 p.m. today in search of a medal, running from lane seven. McMaster recorded the day's third fastest time when he won the second of three heats in a season's best 50.49 seconds just off his 50.16 best from 2015, to secure one of the two automatic spots in the final. McMaster-who won the National Jr. Colleges Indoor Championships 400m but injury kept him out of out door competition before being cut by Central Arizona-won his preliminary round on Thursday in 51.77 seconds to qualify for yesterday's semifinal. 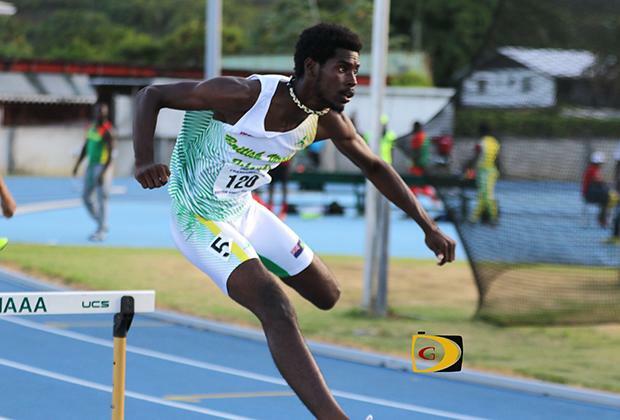 It was just his fourth race of the season after opening with 51.55 seconds in Florida to qualify for World Juniors and a 51.02 in the 2nd OECS Championships in July 3. "Today's race felt really good and the aim was to go out there and put myself in a position from the start to get into the final," McMaster explained. "Once I got that, it was just to execute and maintain what I got and go home from there. From the start, I got myself into a position were I didn't have to worry as much about my positon. I'm just looking to get through the final injury free and I'll be happy with that." McMaster joins Chantel Malone as the second BVI athlete to reach a World Jr. Championships final, with Malone qualifying in both the 400m and Long Jump in 2010. The BVI has never won a medal in the IAAF World Jr. Championships. In what was to be the the biggest race of her young hurdling career, disaster struck for Lakeisha "Mimi" Warner on Thursday, when her trail leg hit the first hurdle and she tripped and fell hard to the ground in the semifinals of the 400m Hurdles, ending her 2016 season. Warner who bruised her shoulder, was taken to hospital as a precaution and later released with no injuries, but said she had lots of soreness on Friday. L'T'Sha Fahie placed eight in her 100m semifinal in 11.91 seconds on Thursday.